You’ve got 7 speakers, 5 rooms, and 3 different session tracks over 2 days. You’re huddled around a bulletin board with your team pinning notecards to a scheduling idea you pulled off Pinterest. Sound familiar? The problem is: once you get your schedule straight, how do you communicate it to your third party vendors or team members (especially when you need to make last minute changes)? Time to hit Excel. Luckily, we’ve designed a nice-looking, easy-to-read spreadsheet to keep your session details, speaker information, and other presentation logistics organized and ready to share. We’ve also put together a tutorial for you so you know how to use the template. Thanks for downloading the conference schedule template! Once you open up the conference planning calendar template, you’ll notice two tabs at the bottom of the Excel spreadsheet. 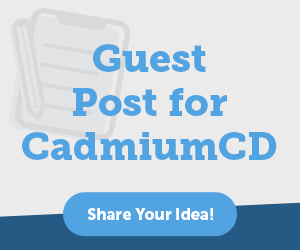 The first, titled “Example Conference Schedule,” is already filled out for a conference we’ll call CadCon 2020. We pre-filled the data in this sheet to give you an idea of how your final calendar should look. Each row represents a particular session and each column represents a different piece of data that you need to know for that session. These include basic speaker details, different track names and sessions types, presentation titles and the rooms where they will be presented, and learning objectives so your attendees will know what to expect. If you click over to the second tab, entitled “Conference Schedule Template,” you’ll see the same spreadsheet with blank data. Click this now and let’s get started planning. The first thing you need to do when planning your event is come up with some basic ideas about your event’s structure. Will it be a one day event? A multi-day event? How many sessions can you realistically fit into a day? Does it make sense to have multiple tracks with simultaneous sessions that attendees can choose from? For the purposes of this tutorial, we’ll use the conference schedule template to plan a three day event with 7 sessions each day. The light rows on the calendar represent each session whereas the dark rows break up each day for visual purposes. No data should be entered in these dark rows. Note: The schedule can be manipulated to meet your needs by adding or removing rows. If you need an additional session on any given day, simply insert another light grey row. Now, let’s add in our basic event details. Enter your event name into B3. Copy this name, select the remaining rows in the lighter gray B columns, and paste. The N column is highlighted with the darker grey color. This is because it represents each day of your event. For a three day event like ours, we simply add the first day into cells N3-N9, the second day into cells N11-N17, and the third day into cells N19-N25. Great! We’re off to a good start. The next thing we need to do is to fill in our 7 sessions. A session can be a presentation, a workshop, lunch, a panel, exhibition hours, or just about anything else. For this section we’ll focus on Track Name, Session Type, Session Number, Presentation Title, Start Time, End Time, and Room. You can fill these cells out in any order, but I like to start with Session Type because it helps me formulate a basic layout of the day in my head. K3 will kick the day off with an opening session, which I’ll number ‘101’ in cell L3, a lecture will follow after, then a panel and lunch. I’ll continue numbering these in an ascending order (you can number your sessions with whatever convention you’d like). After lunch there will be two simultaneous sessions, a workshop and a panel. For these I’ll number them ‘105A’ and ‘105B.’ Finally, I want to end the day with a trade show and cocktail hours in the expo hall. I will repeat a similar schedule for days 2 and 3. The next thing you want to add is your speaker details. At this point in the planning process you should have chosen your speakers and collected most of their basic details. If you haven’t done this yet, go here to learn how to streamline the speaker management process before you get started. This is pretty straight forward. You probably have in mind who you want to be keynotes, who you want as panelists, and who will be part of the lectures and workshops. Simply plug their First Name, Last Name, Email Address, Position, Organization, Biography, and Presentation Role into columns B-I in the light grey cells. For certain session types, like Lunch or Expo Hours, simply leave these details blank in that particular row. The remaining columns, M and Q-U, will hold information relevant to the actual presentations the speakers will be giving. Now that you have your speaker information added, simply plug in their presentations, session descriptions, and learning objectives and voila! you’ve completed your schedule. Now that you’ve got all your event data entered into the conference planning calendar, you can send it off to your program guide printer so they can make a hard copy of your schedule for your attendees, or you can import the data to your conference app or conference website. The important thing is you now have a way to plan your conference schedule in a clear, well-organized document that can be shared with your own meeting planning team as well as third party vendors. Michael Doane is head of marketing at CadmiumCD. He is focused on educating event planners about the benefits of implementing technology at their trade shows and conferences. Download his free eBook, “The Most Influential Advances in Event Technology“, then connect with him on LinkedIn or Twitter. CadCon 2015 Was a Huge Success! 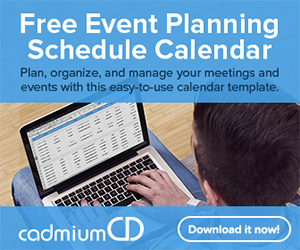 3 Responses to " The Conference Planning Calendar Every Event Manager Needs [Free Template] "